Unpopular Culture | Bringing the world the best of the worst! And a new voice has spoken up for Frank! Patsy P. has written in to give her thoughts on Frank’s reviewing prowess. You can read her comment here, and below it is my comment to her comment. If you’re just now coming to the party, click on that link, scroll all the way to the top, and dive in. If you haven’t joined the discussion yet, what are you waiting for? Am I wrong? Has all of the metro Boston area sipped some of Frank’s Kool-Aid? Which fork do you use for the salad? The questions keep coming! Join us! Doesn’t everything sound better in French? For you constant readers of the blog (all three of you, and thank you, by the way), I know that it’s been, what, six months since I’ve posted anything? I’ve been dissertationing lately, and I haven’t had much time for posts. Having said that, I’ll soon be working on a review of a DVD (found, fittingly, at a pawn shop) that is so mind-bogglingly awful that I just HAVE to let you in on the fun. It may be another month or so before I get that post up, but it will be coming. Now, on to today’s topic. You same three constant readers surely remember my post about Frank Ochieng, don’t you? If you don’t, you can click here and catch up. Anyway, Frank’s staunchest defender, Tam, has written in for the first time in over a year and a half to point out some feathers in Frank’s cap. It’s good to have her back. It may sound odd, but it makes my heart sort of skip a beat knowing that Frank has a fan so dedicated to his work that she’s still trying to win me over to his cause almost two years after I declared him to be the worst film critic ever. It’s not like I am the arbiter of taste for the world; it’s my opinion on my little blog…and that’s all it is–my opinion. My hope is that, after reading the samples of Frank’s work that I’ve discussed, you might go read more of his criticism and form your own opinions. This can only be good for Frank, as he’ll be getting more page hits from his exposure here, which always looks good to the higher-ups. And there are always higher-ups. So, to check out Tam’s comment and my reply to it, go to the link above (or if that involves too much scrolling, just click here–like the old Campbell 66 Express trucks’ slogan says, I’m humpin’ to please) and scroll down to the last two comments. Once you’ve read them over, go to his website and read some of his latest full reviews. You’ll find a link to his website in my last comment. Then come back and leave a comment either on this post or on the older post. I’d love to hear what your feelings are on Frank’s merits as a critic. Am I wrong and is Tam right? I want to know what you think. I saw this back in the day on VHS. It had that crazy box that had a button on it that when pushed would blare out “WANNA DATE?” in Patty Mullen / Frankenhooker’s voice. At the time I thought the movie was fairly amusing, but pretty slight. I was kind of dreading watching it again, as I just knew that, since I wasn’t particularly impressed with it the first time around, I would probably hate it this go-round. Surprisingly (to me, at least), I enjoyed it quite a bit more than I expected to. I actually laughed out loud a few times, especially at Patty Mullen’s bizarro facial quirks and at several of James Lorinz’s off-the-cuff remarks. Is it stupid? You betcha–but it’s pretty short and has several attractive women, a couple of better-than-they-deserve-to-be performances, and exploding crack whores. It was co-written by Fangoria magazine’s first editor, Bob Martin. Ryan Reynolds spends an hour and a half buried in a box in the desert somewhere in Iraq. We spend it, every minute of it, in the box with him. In many ways, Buried is a marvel. The ingenuity required to hold an audience’s attention with only one character to work with (and he’s in a wooden box that’s about the same size and shape as a coffin) is substantial, yet director Rodrigo Cortés and writer Chris Sparling manage to pull off this difficult feat with amazing dexterity. For me, the MVP award for crew member goes to James Muñoz, whose work as sound designer and supervising sound editor really created an incredibly immersive sound field. It seems odd to praise a film that takes place in a box for its sound, but that aspect of the film, more than any other, really puts the viewer into the head space of the main character. Still, even though the film is really quite amazing, it’s such a downer to watch that I don’t expect to see it very many more times. It’s just too draining. However, if you loved Open Water, Buried might be the feel-good film of the year for you. It’s NOT recommended for claustrophobes, ophidiophobes*, or claustrophobic ophidiophobes. *I had to look it up; now you have to look it up. Fair is fair. Ethan Hawke plays a failed novelist who has turned to writing true-crime books to pay the bills. He moves his family into a house where the previous family had all been hanged from a tree in the backyard…except for one daughter, who was never found. While moving in, he finds a projector and a box of old Super 8 films in the attic. While watching the films later, he discovers that they document the murders of several families, including the one that had taken place in his new house. And then things get REALLY weird. I wanted to like Sinister–honest, I did. And I guess that I did like it, in some small way. I just didn’t find it to be very scary, and the explanation for what was causing all the weirdness was pretty lame. And the lead bogeyman apparently moonlights as a member of the band Slipknot. As for positive traits, there was some good atmosphere, and the performances were okay. But aside from a few jump scares where the soundtrack GETS VERY LOUD ALL OF A SUDDEN, it didn’t raise my heartbeat much. I tend to judge horror films by whether they give me gooseflesh–whether they make my skin crawl. All of my favorites have a least one moment in each of them that really makes me squirm. Sinister never had that moment. Oh, but I thought that I was going to like this one. There’s a moment in most films that hooks me, and I know precisely at that moment that I’m going to like the film. It’s not usually a big plot point, either–the majority of the time, it’s a tiny little inconsequential thing that suddenly gives me the feeling that I’ve got a personal connection with the filmmaker and that I’ll gladly go wherever he or she leads. It happened with Polanski’s Repulsion, it happened with A Tale of Two Sisters, and I thought that it had happened with this film. The moment in question occurs very early in the film, at the big party scene near the beginning. There’s a long involved shot that starts in one room on one teenaged couple, then moves to another room and another couple, and ends up on yet another couple. My thought was that this was a pretty ambitious camera move for a low-budget horror film, so my expectations went up mightily. But my instincts were wrong this time, and the film came crashing back down to earth pretty quickly. For me, there were two main factors that finally killed my interest in the film: an overly-complex script, and a stupid game chant that all the characters knew as children. I wasn’t totally down with the whole “One, two, Freddy’s coming for you” rhyme in A Nightmare on Elm Street, because it seemed a little far-fetched…but the chant in this one was waaaaay unbelievable. “Release the one ignored by heaven”…really? “Forgotten souls erased by time?” No way. Kids just don’t play like that. My final verdict: There’s nothing in Forget Me Not that you won’t forget…and soon. I saw these the other day at Walgreen’s (or was it Walmart? Wallpaper Plus? Walpurgisnacht?) and I had to have them. 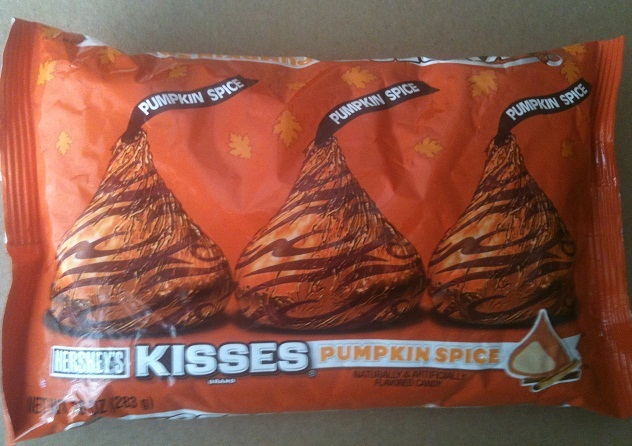 I have a major, major jones for anything pumpkin-flavored. When I lived in Japan, fall was pumpkin-flavored candy time, and they even made pumpkin Pocky, which was so delightful that I bought every box one 7-11 had so that I wouldn’t run out. The fall = pumpkin flavor thing seems to be catching on in the United States as well, since there are more pumpkin-flavored things this year than I’ve ever seen before. So, what about these? Yum. Or, to paraphrase a Woody Allen line from Annie Hall, yurrm. I thought that they might have a chocolate outer shell filled with pumpkin-y gooey stuff, but I was wrong. Instead, they have a wonderfully pumpkin-colored outer shell filled with white gooey stuff. Oddly enough, the colored shell seems to be white (well, orange) chocolate, while the gooey interior has the pumpkin spice flavor. In the end, it doesn’t matter. 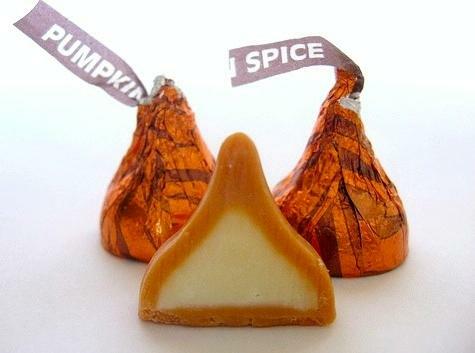 If you like pumpkin, and you like candy, you’ll probably like this pumpkin-flavored candy.